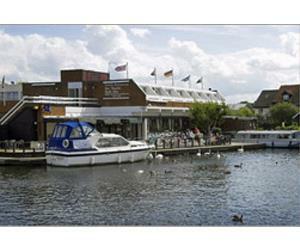 Hotel Wroxham01603 782061work01603 784279fax HotelAt the heart of the Norfolk Broads, eight miles from Norwich and 20 miles from Great Yarmouth, the Hotel Wroxham enjoys an enviable position with superb views of one of the busiest stretches of the River Bure. The hotel has eighteen en-suite rooms, all allocated on the first floor, comprising of doubles, twins and single rooms, many of which have superb river views. All with tea and coffee making facilities, direct dial telephones, television and hairdryers. The hotel boasts parking for up to 40 cars, free of charge to hotel guests. Visitors may choose to arrive by boat and use the hotel's mooring, a small fee is payable. The hotel and public areas have disabled access, with accessible toilets located on the ground floor. At the heart of the Norfolk Broads, eight miles from Norwich and 20 miles from Great Yarmouth, the Hotel Wroxham enjoys an enviable position with superb views of one of the busiest stretches of the River Bure. The hotel offers a full bar food menu (running all day throughout the summer months) plus the Riverside Carvery @ £5.95, a well stocked bar, featuring a wide range of well kept lagers and real ales. Relax over a pint and a sandwich or choose from our bar meals or specials board, featuring local produce. Whatever your dining preference Hotel Wroxham offers a relaxing atmosphere, wonderful views and a warm welcome. Eight miles north east of Norwich.